With its highly developed capacity to detect patterns in data, Perl has become one of the most popular languages for biological data analysis. But if you're a biologist with little or no programming experience, starting out in Perl can be a challenge. Many biologists have a difficult time learning how to apply the language to bioinformatics. The most popular Perl programming books are often too theoretical and too focused on computer science for a non-programming biologist who needs to solve very specific problems. 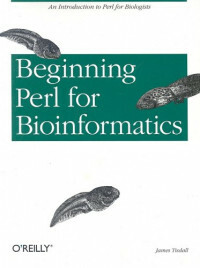 "Beginning Perl for Bioinformatics" is designed to get you quickly over the Perl language barrier by approaching programming as an important new laboratory skill, revealing Perl programs and techniques that are immediately useful in the lab. Each chapter focuses on solving a particular bioinformatics problem or class of problems, starting with the simplest and increasing in complexity as the book progresses. Each chapter includes programming exercises and teaches bioinformatics by showing and modifying programs that deal with various kinds of practical biological problems. By the end of the book you'll have a solid understanding of Perl basics, a collection of programs for such tasks as parsing BLAST and GenBank, and the skills to take on more advanced bioinformatics programming. Some of the later chapters focus in greater detail on specific bioinformatics topics. This book is suitable for use as a classroom textbook, for self-study, and as a reference. Designed to get you quickly over the Perl language barrier by approaching programming as an important new laboratory skill revealing Perl programs and techniques that are immediately useful in the lab. Softcover. James Tisdall has worked as a musician, a programmer at Bell Labs (where he programmed for speech research and discovered a formal language for musical rhythm), and as a bioinformaticist at Mercator Genetics in Menlo Park, California, and at Fox Chase Cancer Center in Philadelphia. He has a B.A. in mathematics from the City College of New York and an M.S. in computer science from Columbia University; he is working towards a Ph.D. in computer science at the University of Pennsylvania. In his spare time, Jim teaches computer music at the Settlement Music School in Philadelphia. He is also the author of O'Reilly's Beginning Perl for Bioinformatics. Beginning Java with WebSphere provides a step-by-step guide for creating and installing both client- and server-based Java applications using Rapid Application Development v8, WebSphere Application Server 8.0, and Java.